As foodies, we have always been a great fan of Sizzler because it's smoky taste with a mixed bag full of various fillings never fail to amaze us. Our taste buds were lit as soon as we got the news of Nasiklub organizing the Sizzler Festival and we decided to rush there right away in order to heat up our hunger games! As expected, the menu consisted of 7 vegetarian Sizzlers as majority of people avoid eating non-veg here in Maharashtra during the Ganesh Chaturthi. 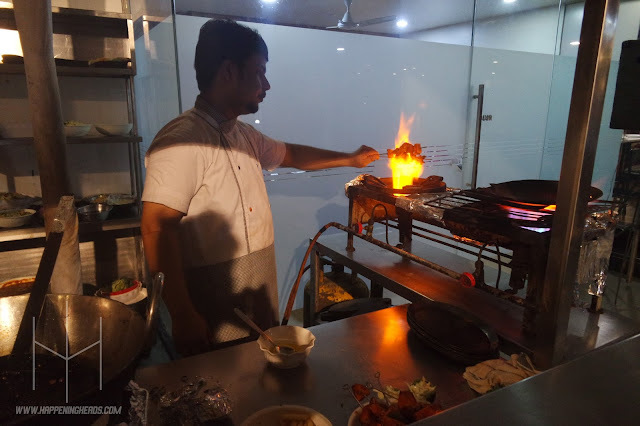 We were highly impressed with the names of the dishes because they depicted a smart way of substituting the meat with a combination of veggies and coated cheese to make sure that the real feeling of gulping a hot and smoky Sizzler doesn't get affected due to the absence of meat. We share mutual love for Chinese cuisine so Chinese Sizzler was hands down our first choice as soon as we came across it in the menu card. The tangy flavour of this Sizzler provided just the most perfect amount of delight to our taste buds. The combination of Hakka Noodles, Fried Rice and Veg. Manchurian in a Smoky Chinese Gravy was complimenting the overall taste very well. 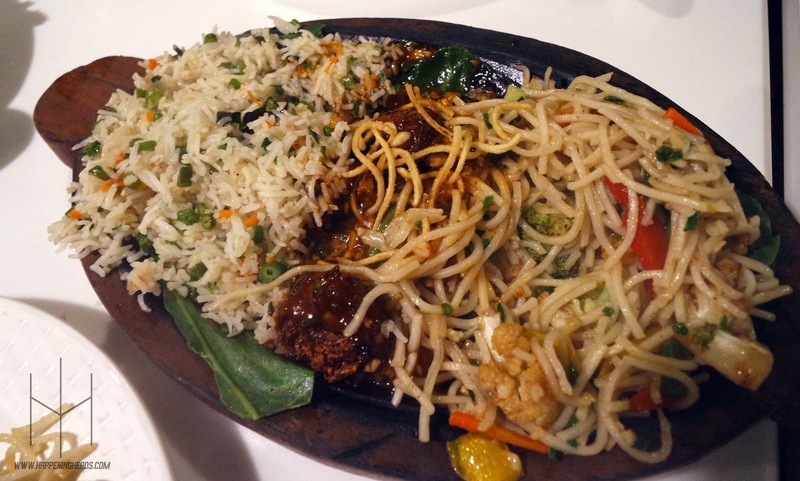 Not to forget, the crispy noodles which sealed the deal for us after every single bite of this delectable Sizzler. 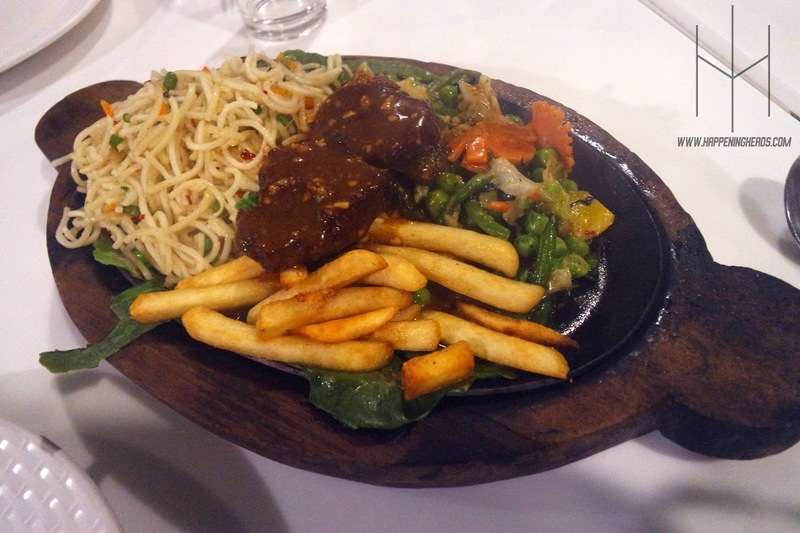 We had to try the Steak Sizzler especially because of the fact that it is consider as one of the most popular Sizzler in the world and also because Steak is something which drives us crazy! The combo of cutlet (which we felt did justice to the role of Steak!) along with the noodles and caramalized vegetables tasted amazingly well and the addition of French Fries surely bettered our moods! Our endless affection towards Italian food is what forced our mind to order the Italian Sizzler to be honest. It consisted of the exquisite Pasta, tossed in the trademarked Italian red sauce and to compliment it further, the ferfalle pastas were served with cheesy white sauce. 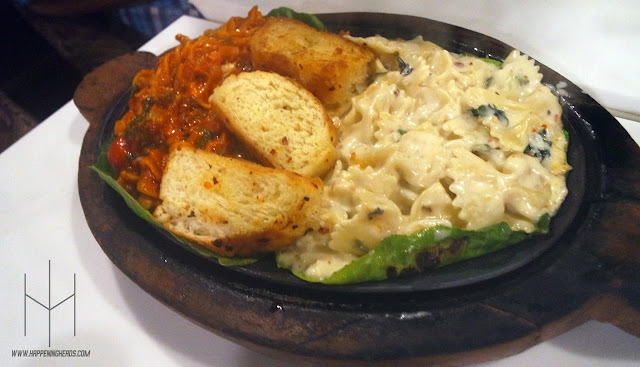 Though, our eyes lit up after seeing this classic Sizzler crowned with our favourite - Garlic Breads! Frankly speaking, we ordered the Paneer Shaslik Sizzler as our backup Sizzler in case, we are disappointed with our other choices (just kidding!) Whenever we plan to eat Sizzlers, Paneer Shaslik Sizzler has to be present on our table as a part of habitual ritual because the preparation of this Sizzler never disappoints us. The combination roasted Paneer, served with steamed rice and the caramalized veggies, served with the sizzling barbeque sauce has always been a treat for us. Also, we loved the accompaniment of the capsicum, stuffed with deliciously creamy salad. REMARKS: Nasiklub always does the great job of hosting various themes in the restaurant. The Sizzler Festival was definitely a big hit and we were highly impressed with the way Sizzlers were prepared. We didn't missed Non-Veg, even for a second - We feel this best sums up our feelings! Don't forget to 'LIKE' Nasiklub's Facebook Page and 'FOLLOW' them on Twitter and Instagram for all the updates. Also, check out their Zomato Profile to know more about them!